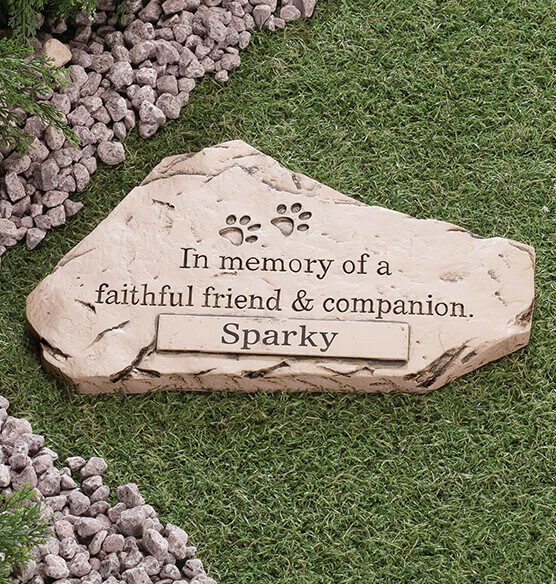 Keep your faithful friend's memory close with this personalized Faithful Friend & Companion memorial stone—lovingly personalized to comfort your heart. Artfully detailed, yet wonderfully substantial, the 3-D pet stone is cast in solid cement and designed for lasting durability. Along with two paw prints, our exclusive design is etched with the sentiments "In memory of a faithful friend & companion". We'll add your pet's name, creating a treasure celebrating your love. Specify name; limit 1 line, 12 letters/spaces. Stone memorial measures 9" long x 15" wide; weighs 5.5 lbs. Stone should be brought in over the cold winter months to prevent damage. My two precious cats passed away and I wanted something to put in my garden as a remembrance of them. These stones are gorgeous and very well made. The personalization was perfectly done. I would highly recommend this memorial stone. I will definitely buy products from this company again! I received the memorial stone but it had not been engraved! my friend lost their pet recently and I thought this would be nice to give to him. I had just lost my dog after 16 years. I buried her in the garden. A private space and I believe the stone will complete her departure and serve as a loving reminder. So sweet and the price is perfect. I chose this item because I liked the sentiment and that it could be personalized with my pets name. Friends dog passed away and I didn't know the year the dog was born so this was a nice option without having to place the year - year information. Because it beautiful and my baby passed away after 19 years.. He was my best friend!!! BEST ANSWER: Thank you for your question. You can get a date on the Memorial instead of a name. We hope this information will be of help to you.